In a thrilling fashion, Michigan Basketball defeated 22nd ranked Wisconsin to win the 2017 Big Ten Tournament — their second title in team history. Despite numerous obstacles set in their way, John Beilein and his Wolverines utilized an unstoppable combination of precision shooting and senior leadership to achieve victory, putting aside previous failures during the regular season. Not even a plane crash could bring them down. While Michigan fans across the country continue to revel in the glory of a miraculous tournament win, the real tournament doesn’t begin until this Friday. If the Wolverines can carry over their Big Ten successes to the Big Dance, they have a strong chance to make a deep NCAA tournament run. Senior Derrick Walton Jr. commanded attention on the court, standing out as a formidable force on both sides of the ball. Even with five stitches in his knee, Walton provided the Wolverines their most consistent and explosive option on offense. Particularly in a semifinal matchup against Minnesota, Walton dominated the Golden Gophers’ defensive front, scoring a career-high 29 points — 19 coming in the first half alone. More importantly, Walton showcased his ability to lead. Recording nine assists against Minnesota, Walton perfectly orchestrated the nuances of Beilein’s fast-paced spread offense, spreading out the defense while crafting scoring opportunities with ease. Such craftiness and selflessness with the ball will be vital for the Wolverines throughout the NCAA tournament. On the whole, Walton served as Michigan’s most consistent scoring threat; however, his recent successes cannot become a crutch for the Wolverines to rely on. In multiple late-game scenarios, Michigan’s offense devolved from a fine-tuned spread machine into the “Derrick Walton Jr. Show”. All the positives of Walton’s play — the methodical passing, leadership and scoring potential — were replaced with an incessant desire for the star guard to control the ball at all times. It was almost as though the Michigan bench unanimously began trusting Walton to do everything, which he clearly cannot. For the Wolverines to remain competitive, they must capitalize on the outstanding athleticism and talent of Walton without exuding such an overreliance on his performance. Alongside Walton, redshirt sophomore DJ Wilson proved vital to the Wolverines’ success. As remarked by multiple commentators throughout the tournament, Wilson needed to play well, and did exactly that. On offense, Wilson commanded attention in the post, shooting around 60% over his past four games. Even further, as is tradition for any Beilein offense, Wilson found success behind the 3-point arc, netting two against Purdue in a breakout 26 point performance. While offensive production remains vital, Wilson’s strongest contribution to Michigan’s success comes in the form of a staunch and disciplined defense. At 6’10”, Wilson commands attention on the court, muscling his way to decisive rebounds and closing off opposing scoring lanes. Notably, he earned a whopping three blocks against Purdue in Michigan’s 74-40 thriller. One block even forced the game into overtime. In the wake of Michigan’s unprecedented tournament run, it appears as though head coach John Beilein finally found the groove his offense needed. Relying on quick ball movement, off-ball screens and precise athleticism, Beilein’s spread formation proved unstoppable at times. Even better, it appears Walton Jr. might be one of the best in the country at running it. On pick and roll plays — a staple of spread offenses across the country — Walton currently holds an eFG% of 51.2%, making him the most efficient in the Big Ten. Overall, Michigan relies on high-powered offensive production, especially three-point field goals, to overpower their opponents. However, the Wolverines’ defensive abilities as a unit appeared lacking against multiple tournament opponents. This lack of defensive awareness became most obvious during Michigan’s win over Minnesota. Toward the end of the contest, the Wolverines allowed multiple last minute layups, keeping the Golden Gophers in contention. Additionally, baseline protection appeared nonexistent at times as the Minnesota guards found plenty of running room under the basket. Against Wisconsin, Michigan seemed to renew its commitment to a strong defense. While allowing 54% shooting in the first half, the Wolverines quickly hunkered down, keeping the Badgers without a field goal for the first eight minutes of the second half. Additionally, forward Ethan Happ for Wisconsin was kept in check all contest, shooting only 37.5% under the basket. Unfortunately, superstar Nigel Hayes exploited Michigan’s weak defensive presence along the baseline, picking up some easy dunks in a 14 point performance. 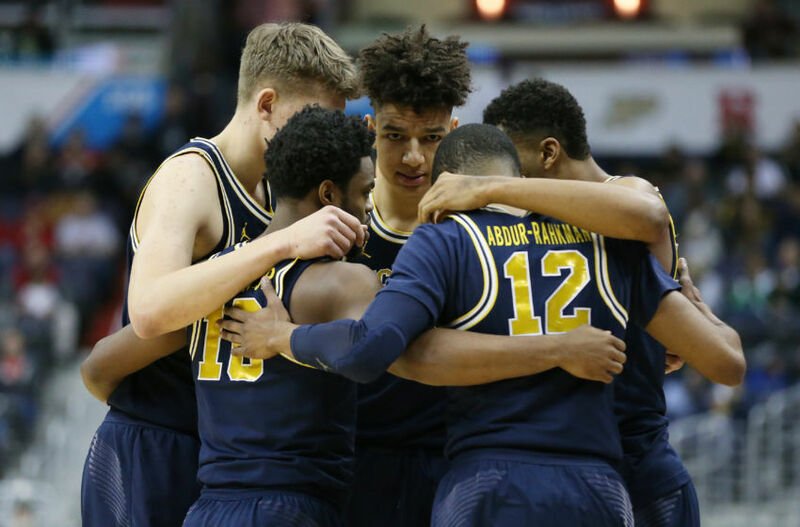 With the Big Ten Tournament behind them, Michigan looks to capture a first-round victory against tenth seed Oklahoma State this Friday at 11:15 AM to kick off the NCAA Tournament. Despite a rather rough start against top competition in the Big 12, the Sooners are a force to be reckoned with and must be approached with the same diligence and preparation Michigan brought to the Big Ten. Michigan has strong potential to execute a deep tournament run this March. Alongside Walton and Wilson, the Wolverines finally appear to have reached mid-season form with tremendous offensive production and chemistry. So long as Beilein renews his squad’s commitment to defensive pressure and preventing open looks, Michigan will be a force to be reckoned with in the field of 68. Better yet, this time around they’ll be able to start this tournament with their actual jerseys.